The subtitle for this book is "What All Christians Believe and Why It Matters." Drury is a professor of practical ministry at Indiana Wesleyan University. He has authored a number of books, and I have read a few of them. Common Ground is my favorite so far. Christians often disagree over doctrinal details, but we should be able to agree on the core beliefs contained in the Apostles' Creed. There are people "out there" today who call themselves Christians but really have no idea what a Christian is supposed to believe. In the introduction, Drury states the reasons why Christians should know and study the creed. In subsequent chapters, he treats each element of the creed, explaining the Biblical basis and why the particular portion is important to today's Christian. He ends each chapter with a prayer which affirms his belief in the doctrine just described. 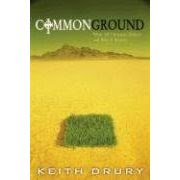 Drury has set up a Common Ground blog for those who use this book as a group study resource. I found the book very easy to understand, and I think it would make an excellent small group study. Find out more about Drury by visiting his Web site.